Drrum's Spectral Tiger Cub Giveaway! Drrum, well-known within the pet collecting community for her amazing gallery of pet screenshots, has also been a great friend to WarcraftPets over the years. She's produced several pieces of artwork for our site, including 2012's holiday art. It's our pleasure to help sponsor her contests and giveaways, one of which is beginning today! Drrum's Winterspring Cub has wandered off and gotten lost! Please help find her and bring her home. The Lost Cub Hunt begins today, January 5th, 2013, and will last through January 14, 2013. 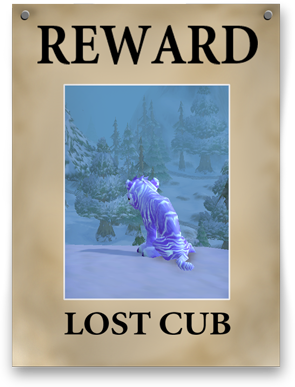 As a REWARD for her beloved cub's safe return, Drrum is giving away a very rare Spectral Kitten Loot Card (redeemable for a Spectral Tiger Cub) to one lucky participant who helps find her! Review the clues found on the giveaway page (linked below), think hard, and determine where Drrum's lost cub can be found!